Back in the hurricane season of '04 he and his siblings were just old enough to be exploring the house and getting into lots of trouble the weekend Hurricane Frances sat on us for 3 days. Hence, originally their names were/are One, Two, Three, and Four Kittehs Of Apocalypse. Their sister, Four, is the second to receive a name, being called Princess Four Tubby Herself for *ahem* obvious reasons. A rather forceful catality, she tended to push her brothers out of the way when food became involved. Three is the first who received another name, when he discovered mirrors and started grooming himself, then dancing back and forth singing 'I'm too sexxy for mah tail...' Srsly, never any posturing, hissing or spitting, he knew it to be Himself in Reflection. Thus did he become Three Fooftah. Only recently did One receive an additional name. Two Kitteh Of Apocalypse is Absent, alas. Ha! Look at that guy! 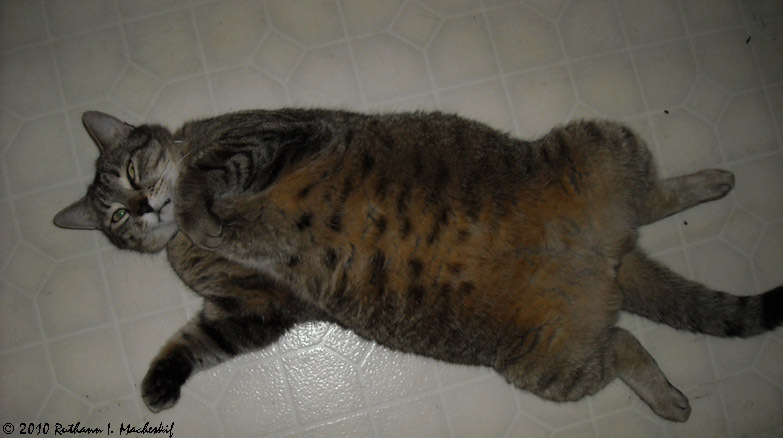 That's one tubby cat, but I love it when they lie like that. THAT is looking for a belly rub.